The District, which offers fine dining from local chefs, is the latest phase of the $125 million reinvention of The Shops at Willow Bend. “We at Starwood Retail had a vision for Willow Bend, and knew it was the perfect location to bring these chef-driven restaurants,” said Jeff Zeigler, COO of Starwood Retail at the ceremony. Whistle Britches is open for lunch and dinner, while Mexican Bar Company has begun dinner service. Lunch service will begin on October 31. Knife will open for dinner on Friday, October 26, with Terra Mediterranean to begin serving customers later this month. 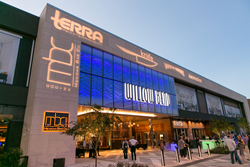 The much-anticipated District is the latest step in the $125 million reinvention of The Shops at Willow Bend into a multi-use urban core, joining the grand opening of Crayola Experience at the project earlier this year and the 2017 debut of Plano Children’s Theater. “Plano is a city on the go – we move quickly, but we also like to slow down and appreciate a delicious meal with friends and family. These restaurants represent some of the best food you can get in North Texas,” said Plano Mayor Harry LaRosiliere at the gala. The ticketed fundraiser on October 5th raised more than $25,000 for the Junior League of Collin County. The festive cocktail reception featured musical performances by the Georgia Bridgewater Orchestra, appetizers from California Pizza Kitchen and bites from Knife, a steakhouse from James Beard-nominated chef and two-time Top Chef contestant John Tesar; Mexican Bar Co. Cocina from James Beard-featured chef Patricio Sandoval; Terra Mediterranean, from brothers Jalal Chanaa and Adam Shanaa; and Whistle Britches, offering southern comfort food from James Beard Foundation-nominated Chef Omar Flores. The evening concluded with Australian-style coffee from Ascension Annex and desserts from Neiman Marcus Mariposa. The District was built on the site of a long-shuttered department store anchor. When Starwood Retail Partners’ parent Starwood Capital Group acquired in 2014, the management company began assessing the best use for the property and determined that expanding dining and entertainment options would best serve the growing Plano community.